Disclaimer: All of the content below is heavily work in progress and is subject to change. The uniqueness of Foxhole stems from its uncompromising focus in achieving a truly persistent war MMO. We have a singular vision, and we plan our years work to achieve that goal. Quality of life features are exceptionally important, but they aren’t always the primary focus of our attention, as there are core parts of Foxhole that yet to be realized. 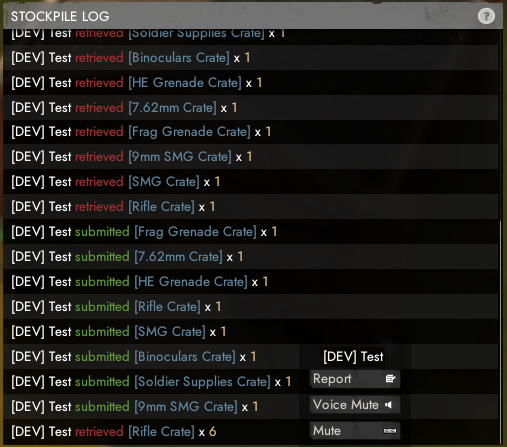 That being said, we are reminded by our community that certain features are critical to those that play Foxhole regularly. We’re excited to show off some of the latest quality of life features that we have been developing, many which have been influenced or suggested by community members. Specifically, we’ve focused on addressing much of feedback we’ve been getting from logistics players. Logistics often players don’t have the information they need to perform their jobs in an efficient/engaging manner. Whether it’s wanting to know what items to bring to which strategic location or to know if a key base is low on soldier supplies, players are currently blind. We are working on a way to display information relevant to a map object (such as a base or factory) in a digestible manner. This information will be presented via a contextual tooltip that is shown when a map object is hovered. We will be reducing the map legend to a more compact version of it’s former self, as it will now only contain options to filter information. As a little bonus, we also cleaned up the map info widget and are displaying the region name, time more clearly. 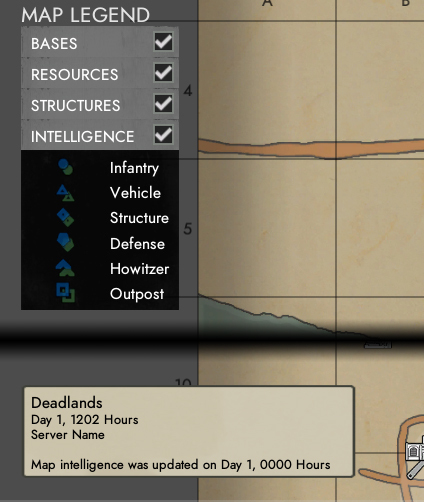 We have lots of ideas of connecting this information with radios and intel gathering, but for now it will probably work as is. note: Working on features like this is the exact reason why we changed the UI to our current system. This modular way of designing the UI allows for features like this. To resolve conflicts that occur when interacting with multiple items on the ground, structures, and other usable. 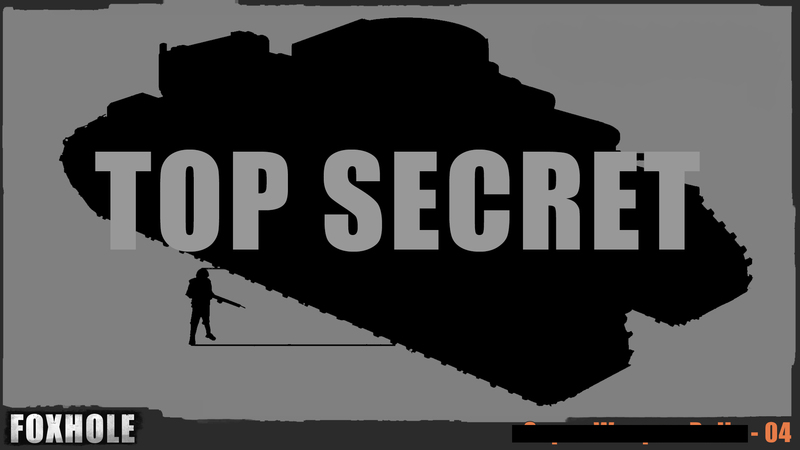 We are working on an interactive menu that does not interfere with the flow of Foxhole. Pressing E while next to multiple objects will display a small menu beside your player character. This list will remain open until you hit ‘Esc’ or go to another UI window. The days of standing on a battlefield trying to pick up rifle ammo are over. The list will dynamically scale its size based on the number of items on it and will have a scrollbar. Item context hovers will now display the amount of ammo it has loaded. This works everywhere there is a contextual hover on an item. Stockpiles will now be sorted by whether or not it has the item. Any items with a quantity of 1 or more should show up before items with a quantity of 0. Items will still be sorted with like-items (ex: rifle and rifle ammo etc). This should reduce the amount of scrolling that’s necessary to reach stocked items. Note: Stockpile sorting order only refreshes when opening the UI or changing categories. 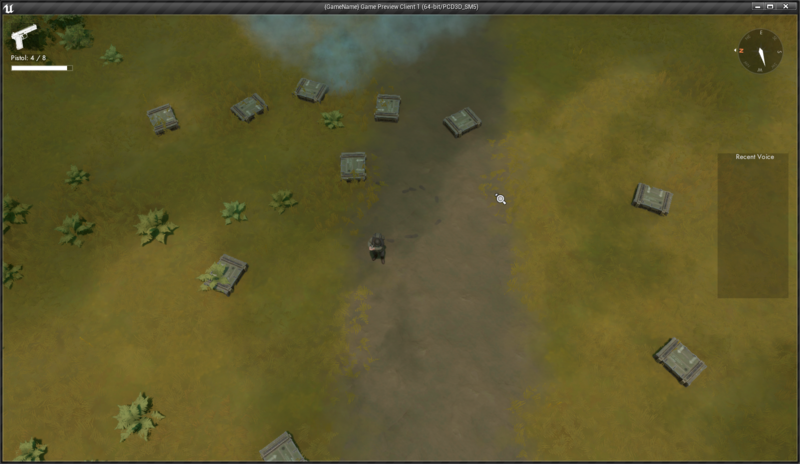 We plan to clean up battlefields and help with item organization by adding vehicles ‘trunks’. These are the equivalent to player backpacks and will allow for ease of access to the contents of a truck with less fear of losing them. You will not be able to destroy these trunks. 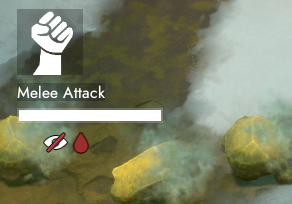 We are also implementing a status effect icon for bleeding. 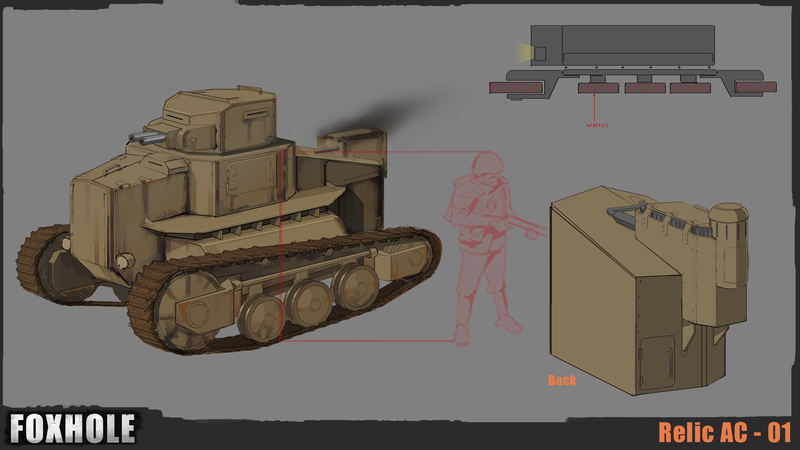 ‘What if players found a rusted tank in a component node and got it working again?’ This question seemed most exciting to us as Mark and I discussed ideas on adding new objectives to the first days of the war. We wanted something that would support capturing towns and supply lines, but would reward explorers and scouts in the early game. Something that would create organic and dynamic front-line fights outside of towns. The idea of ‘Relics’ was born out of this desire. Vehicles or even [REDACTED] from the great war period rusting in fields and forest or stuck in the ice waiting to be found. An unexpected influence on relics was the dead harvest event. Something that resonated with us was the idea of finding weapons and gear out in the world. Currently, players don’t need to go hunting for scrap, components or towns to claim. In the Dead Harvest, you knew to look in the buildings to find guns. Working towards making relics hidden at random locations throughout the regions offers the most exciting version of this idea. This theme fit so naturally into the rest of the game since there are already tones of hidden lore scattered throughout the game world. These first relic tanks allowed me to explore what an older generation from the great war looked like. I delved into a pre-ww1 tank design. Something that resonated to me was the feeling that ground traversal was the main opponent to overcome for these vehicles. Second the bulky ugly and dumb look to armor that only needed to stand up to machine gun fire. 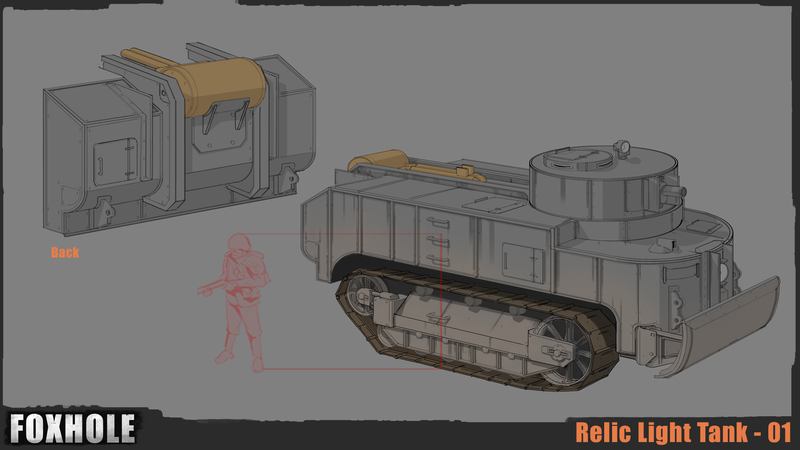 These I tried to bring forward into the relic vehicles. Something that dawned on me was these vehicles don’t need a faction counterpart. Since players do not build them both sides don’t need a version of the same thing. This allows for more narrative storytelling: Maybe both factions didn’t utilize tanks in the same way, or was it that one side had better engineering so their relic tanks could be utilized again years later? We are very excited to explore this idea in further detail in the future. Stay tuned! Note: Relics are still a work in progress so you won’t see them until after Update 22. Gameplay mechanics tied to this feature may change. Thanks to the community for sounding the alarm on the increasing incidents of griefing, which has clearly had a negative affect on the players that have experienced it. We’re constantly looking for long term ways to solve chronic griefing problems as oppose to short term quick fixes, but we do recognize the urgency to address recent issues so for update 22, we’ve focused heavily on implementing new features and changes to mitigate griefing in the game. I know this has been a critical point for a lot of you out there so I appreciate the patience that you guys have had. Stockpile Log Every stockpile will now have a log that can be viewed by any player. The log will show a list of all critical interactions with the stockpile, ensuring that players are kept accountable for their actions. 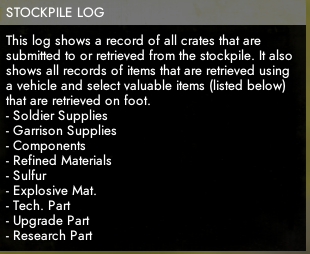 The stockpile log currently show item retrievals for key items, crates, as well as any items retrieved using a vehicle. Clicking on a log entry will open up a contextual menu that can allow you to perform various actions on the associated player, including reporting the user for griefing. 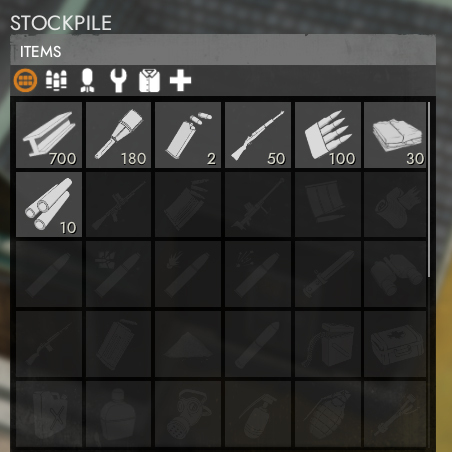 Besides it’s role in alleviating griefing, we hope this log will also serve to give visibility to players that have heavily contributed to a stockpile. The context menu will allow you to commend a player that appears in list directly from the log screen. To help mitigate stealing, players will now be restricted from wrenching vehicles that have been used by a friendly player in the last 15 minutes. You will no longer have to worry about friendly players stealing your vehicle if you have to step away for a few moments. You said it. We listened. 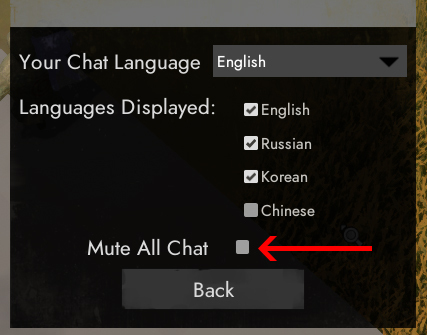 You will now be able to mute the all chat via the chat options. This should hopefully help to alleviate some of the toxicity that sometimes occurs as a result of having a global chat channel. Recently we implemented some new back end systems to better track uses of family sharing. We wanted to gain visibility on legitimate and abusive uses of family share. To address the misuses of family sharing, starting in update 20 all accounts that are under a family share account will now be locked to the same faction. No exceptions. We will also be adding several new tools that will give the moderators more visibility on player actions and more power to resolve griefing issues in-game. For obvious reasons we are unfortunately unable to delve into the details of these additions.